The big match this weekend was Cardiff-Sunderland. Much has already been said about it, but I’ll throw in my two cents. Overall both Ki and Kim did well. I thought of the two, Kim was slightly better in that he seemed to be a potentially more decisive player. Ki, while talented, I still feel is too passive. While he’s good at making himself available, he seems to always play it safe. The vast majority of his passes were short passes, and about half went square or back. Ki certainly has the ability to be a more important player, but the mentality seems to be lacking. That desire to demand the ball, to drive a team forward, to attempt (at times) those defense-splitting passes. Ki could be that kind of player, but we just don’t see it enough. Granted that may be on account of how he is instructed to play, but it’s slightly frustrating for me personally. Kim had a solid game. He can fade from games at times, but when he’s on Kim can be a great, great player. There were times when his bursts and energy really overwhelmed Sunderland, but at other times he tends to drift out and disappear. Something he can’t do when he’s played in that more central role. It’ll be interesting to see how the new Cardiff manager utilizes Kim, as Malky Mackay didn’t always seem to know where to play him, central or out wide. How Kim spends the second half of the season could be key in how Hong Myeong-Bo shapes his attacking four at the World Cup. Kimbo – Cardiff City Stadium was wondering how Kim Bo-Kyung would do, having been sidelined with limited minutes from the bench for the Bluebirds’ last several matches. Rotational needs with the busy festive schedule dictated that Kimbo would get his first start since the beginning of December. In short, it was very satisfying to hear the ooh’s and ahh’s from the stadium each time Kimbo put on a dazzling display of footwork, weaving in between Sunderland’s defense. His through passes delivered to Campbell and Mutch were particularly dangerous to the Blackcats. Let’s go to ESPN FC in their description of the 3rd minute: “[Mutch] should have given the hosts the lead in the third minute, but could not keep his header down from a Craig Noone cross after Kim Bo-kyung beat compatriot Ki Sung-yueng to the ball in midfield.” Later in the 13th minute, despite being marked heavily by Ki, Kimbo was able to get a rocket shot on goal that Mannone just managed to tip over the bar. That led to another observation – it was kind of jarring to see Kim and Ki marking each other at various points throughout the match. Besides which, it was widely anticipated at the beginning of the season that Ki and Kim would face each other, but not in this particular fixture: it would’ve been the South Wales derby between Swansea and Cardiff. 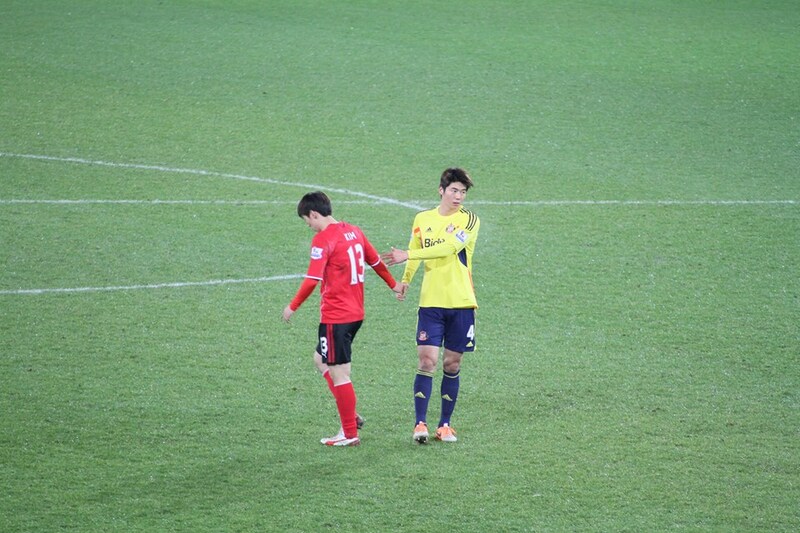 A loan spell for Ki to Sunderland later and it’s still Taeguk Warrior vs Taeguk Warrior: game on. If there was any complaint about Kimbo’s performance, a bit of rust showed as he gave up possession a few times a bit too easily. Overall, however, it was a solid showing. By the time interim manager David Kerslake took off Kimbo in the 79th minute with the game looking well in hand, the Cardiff supporters gave him a cheering ovation in appreciation. Ki Sung-Yeung – cool under fire – that seems to be a hallmark of Ki. That 95% passing rate was just one of the ways he impacted the game. His side had a golden opportunity to gain on Crystal Palace, Fulham and West Ham, but they were falling behind an energetic Cardiff side very quickly. Sunderland couldn’t establish a good rhythm in the first half, their best chance when Ki nearly got an equalizer with a brilliant shot (after some marvelous work to fool Caulker -getting in on an excellent position) that David Marshall barely blocked- the rebound fell to Jozy Alitdore to tap it in -but he sliced it wide! After Cardiff interim manager Kerslake tried to park the bus late in the 2nd half with the score 2-0, the Blackcats got into gear. The late comeback started in the 83rd minute with Ki part of the buildup that led to Fletcher’s tap in goal from Giaccherini’s cross. Then with nail biting tensions mounting, the 5th minute of stoppage was about to expire when Ki sent in a cross that was deflected, fell to Colback, who put the ball to the back of the net, sparking intense celebration from the Sunderland support – and silence from the stunned Cardiff fans. 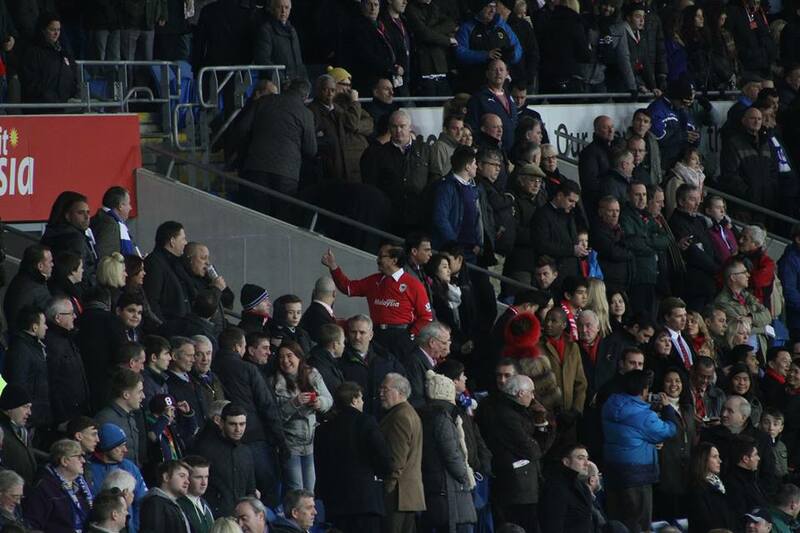 Eventually that led to some boos, particularly for Vincent Tan. Tan didn’t do any favors in the PR department by booing his own team -then evacuating very quickly, his minions in tow. Wait, wait, one more point to get in there. How critical was that point for Sunderland? If you take a look at the bottom part of the table, they are within striking distance of safety – they really could pull this off and beat the stats despite being at the bottom. Still here? Looking over to Jae’s twitter account – he posted some recent videos of Lee Kang-In, a 12 year old prodigy for Valencia’s academy team. There’s a late December youth tournament in which he’s scoring winning goals against Borussia Dortmund, Barcelona, PSG and Juventus, and nearly getting a goal against Real Madrid. It’s been awhile since I heard any news about him – but with these new videos surfacing, the skills this kid is showing is literally jaw dropping. Here’s a marvelous free kick scored against BVB. I’ll post some more soon. eh, what the hell, here’s another one, the only goal of the match against Barcelona’s Infantil A squad. Yow! Jae here, jumping back in. Thought I’d throw up the other Lee Kang-In goals that Roy mentioned. Here’s the one against Juve. And the one against PSG. So Ji started and played the full 90? Or is it a typo? Don’t see it. Maybe Roy already fixed it? If it was there, it was a typo. mighty fine clips of that Lee. the next generation looks rather filthy. wish we could have one of them right now. it would really make a difference. and I agree with Jae on Ki. having watched Ki his entire career just about, Im a little disappointed with how he’s developed. he is WAY too safe IMO and that pass success rate is a slightly inflated stat by itself. the way he’s being implemented at club level as much to do with it imo. he should be starting more real counters. like aggressive counters. i want to say its the mentality of a stopper but I think thats a cop out. Granted Lee Kang-In is probably another 6-7 years from coming close to the senior set up, but I’m imagining an attacking trident of Son Heung-Min on the left, Lee Seung-Woo in the center, and Lee Kang-In on the right. Ho ho. Granted we still won’t have a decent defense but oh well. the way ki plays is instructed by his manager. you can tell by the difference in his attacking mentality before and after fletcher came on for borini. cardiff controlled the first half and in response, poyet had ki in a more withdrawn role as the link between the defenders and midfield throughout the beginning of the second half. very similar to how poyet initially utilized him after taking the job. when sunderland went down 2-0, the team had nothing to lose and pushed forward more, including ki. when fletcher opened the scoring for sunderland, caution was thrown to the wind. his impact from around 75′ on was very noticeable. at sunderland, ki is practically the only midfielder who has the composure to control the rhythm of sunderland’s attack with his control on the ball and sharp passing. many see that as just “safe” play but it’s a vital part of any successful side to have a midfielder who can maintain possession when needed and also to spray accurate passes when the defense yields it. you don’t use an asset like that to break forward whenever possible as we all know ki isn’t quite “three-lunged” nor a speedster. ki’s main threat on attack is his ability to dictate tempo, keep possession, and pass into holes in the defense. his composure on the ball and his long-range shooting can be dangerous around the box, and i’m sure we’ll see more of him involved in the attack. he is plenty capable of pushing forward and being involved around the box but his skills are efficiently used in the manner that poyet has him playing. given the talent he has to work with at sunderland, i think he’s performing very well. you shouldn’t compare the play of ki and kimbo because their roles and playing styles are very different. kimbo is more expected to take on defenders with his dribbling and speed. the same can’t be expected from ki as he has a different skill-set that is much more nuanced but very essential to a side’s success. Certainly there are different ways to look at Ki’s performance. The ratings on Sky mirror what seems to be happening here. The users rated Ki as Sunderland’s best player by some ways, but the “experts” had him firmly average. Here some people saw his performance as average, others as very good. I understand your points, but personally I maintain that it was average. He did dictate the tempo and keep possession, but he didn’t really pass into holes in the defense, and he won’t if he stays as deep as he often does. I’m not advocating that Ki breaks forward whenever possible, but he needs to realize when he should take a chance at launching a counterattack to catch defenders in transition. I wasn’t trying to compare Ki and Kimbo player to player, but rather in respect to their roles within their teams. I thought Kimbo was better than Ki that night. 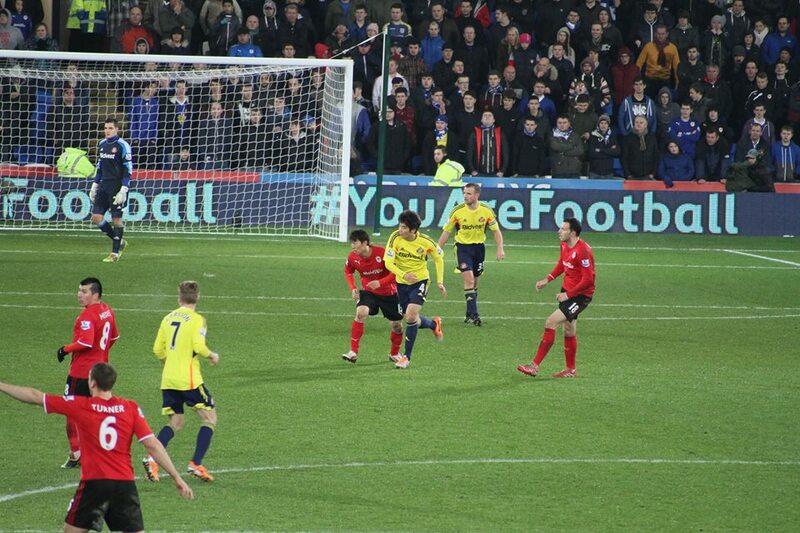 Anyone know why the Cardiff crowd was booing Ki whenever he touched the ball in the first half? I think because of his Swansea connections.